well, not really if you have a fur coat and the heat index is 100 degrees! Heat can be a dangerous enemy for your pet. If you’re uncomfortable in the heat, imagine wearing a fur coat. Your pet can’t tell you that he’s miserable, so it’s up to you to use your personal experience to keep your pet comfortable. Always make sure that your pet has a protected place away from direct sunlight. A spot under a shady tree can be up to ten degrees cooler and will protect your pet from becoming sunburned. 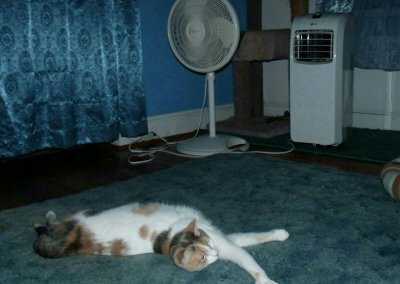 Most cats and dogs enjoy being with the family in the air conditioning, but some prefer to be outside. These pets need to be monitored regularly, and they need access to cool places to lay down and plenty of available clean water. Make sure that your pet does not over exercise in the hot weather, keep play sessions short and fun, followed by a cool down time. If your dog is used to five mile walks every day, consider walking early in the morning or late in the evening when the temperatures are cooler, and consider shortening your travels. Remember your pet is barefooted! Streets become very hot and sometimes asphalt can burn your pet’s feet, so if your pet doesn’t NEED to go to Petco, it might be better to leave him home in the intense heat spell. Hot cars can actually become a death trap for your pet. Car temperatures can rise above 120 degrees quite quickly and in that heat your pet can’t pant fast enough to reduce his core temperature. The heat can actually cause your pet’s temperature to soar and cause brain damage, heart failure, and ultimately death. Do not let your dog drink a lot of water immediately after exercising, as this can cause stomach problems, but do let your pet have a couple of licks of water frequently, or an ice cube to lick on, to keep hydrated. Your pet may have less of an appetite in the hot weather and this can be a normal side effect of the intense heat. The best thing to do is to monitor your pet, and determine if smaller meals on a more frequent schedule keeps your pet eating, or whether your pet may have actually developed a health issue that needs to be addressed by your veterinarian. If your pet has medical conditions, intense heat can exacerbate the problems so you will want to monitor your pet carefully. Dogs may enjoy a swim during hot weather, but make sure that you keep an eye on your pet’s skin and ears. Chemicals can dry out the skin causing irritation, and water can get trapped in the ear canal setting your pet up for ear problems, so always make sure your dog’s ears are examined and dried out after each swim. With a little monitoring from you, your pet should be able to wag his through this heat wave. Next thing you know, we’ll be talking about snow!